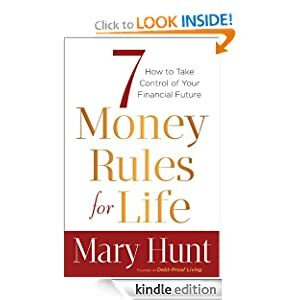 Amazon has a great offer for the e-book 7 Money Rules for Life by Mary Hunt ~ $1.99 today only (Regularly, $17.99). You don’t need a Kindle to read the e-book. You can download a FREE app (here) to use on just about any computer or smartphone (iPhone, BlackBerry, Android or Windows), iTouch or iPad. “Americans young and old are flunking their finances. A shocking 77% live paycheck to paycheck with no savings. And 43% of Americans have less than $10,000 saved for retirement. In the face of this bleak financial picture, bestselling author and finance expert Mary Hunt gives readers the keys to get their money under control and get prepared financially for the rest of their lives. Do note that if you plan to get this book at this $1.99 price, you’ll need to grab this deal today. P.S. You might also be interested in the recent post about Kindle’s FREE lending library here. Posted in Books and Magazines, Dallas, Financial Tips and Tools, Fort Worth, TX, FREE, Saving, Giving, and Living, Stretch your Dollar! Dave Ramsey is making one of his kids audio books available for FREE through Sunday, April 22, 2012. In The Super Red Racer, Junior learns about earning money to buy a new bike ~ a fun and entertaining story that teaches an important life lesson about saving. Download the MP3 audio book now and save it to play during your next trek in the car. It’s a great way to teach kids how to use money responsibly and keep them entertained at the same time! Go here to get the free audio book download. Tax Tip: Homeowners Don’t Miss Out on $500! The Government’s Energy Saving Home Improvement Tax Credit is still available and worth as much as $500 back in your pocket. Even if you just did a home improvement job of replacing windows or insulating your attic you may have money coming back to you. It’s worth checking out. Go here to read more (from the IRS). TurboTax does a good job of explaining improvements that qualify, here. P.S. If you are a TurboTax user, the software itself does a great job of walking you through the Energy saving credit details. 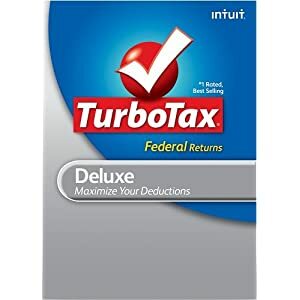 For a limited time, Amazon has the DELUXE TurboTax Version for $26 (go here) ~ still the best price we’ve seen anywhere. Linking to Amazon through our site helps support Frugal in Fort Worth (bunches of thanks)! Posted in Cheap, Financial Tips and Tools, Fort Worth, TX, Home and Garden, Saving, Giving, and Living, Stretch your Dollar! Mortgage Rates Fall to Record Lows. Just because rates have dropped doesn’t necessarily mean that it is wise for everyone to refinance immediately. Refinancing involves applying for a new loan which will be used to pay off the old loan. Remember that mile-high stack of mortgage paper work? You’ll have to go through that process all over again, (but the extra effort could really be worth it in savings). Is Refinancing Your Home Right For You? There are lots of good reasons to refinance your mortgage including a lower interest rate, a shortened mortgage term so you can build equity and get out of debt faster, lower monthly payments, or switching from an adjustable rate to a fixed-rate mortgage. Is the new refinance interest rate at least 1 percent lower than your existing mortgage interest rate? Do I plan to own my home until I break even on the refinance costs? If you answered “no” to either of these questions, it might not make sense for you to refinance at this time, as loan costs could exceed any potential interest savings. Keep reading, if you said “yes” to both questions or if you don’t know the answer (we’ll try to help you figure that out below). If you can say yes to the above questions, you still have a little loan shopping and comparison homework to do in order to decide whether a refinance is a wise option. Find out if your current mortgage has prepayment penalties. Although it is uncommon, some mortgages do charge a prepayment penalty. If this is true of your mortgage, determine how much you will be charged if you pay off your mortgage early. 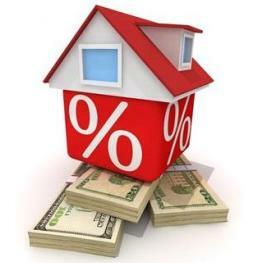 Shop for the best refinance deal. We recommend that you only look at fixed interest loan rates from reputable loan providers (go here to learn more). Also compare your total closing costs and refinance fees among potential lenders, costs like: points, survey fees, appraisal fees, attorney fees, mortgage prepayment penalties and more (read the list of potential fees here). Ask each lender to give a complete list and total cost of fees in writing so that you can make a fair comparison. If they will not give you this in writing, consider this a red flag. Pay the refinancing fees and closing costs out-of-pocket and in cash. If you can swing it, this is typically the better financial option, providing a higher amount of long-term savings. Compare the offers and their potential savings. Use the refinance calculator (here) to compare the interest savings and refinance costs for each lender option and figure out which gives you the most favorable overall cost savings. If you’ll have a prepayment penalty on your current mortgage (Step #1, above), determine what the penalty would be if you refinance, and add that amount to your closing costs when you make your comparisons. Calculate your break-even point. For each loan scenario, write down the number of “months for interest savings to offset closing costs” (9th box down in the refinance calculator). This is also known as your break-even point. Analyze your break-even point. Estimate the number of months you expect to own your home and compare it to the break-even points calculated in steps #4 & #5 of each loan scenario. If the expected number of months that you’ll own your home is greater than the break-even point number of months, then refinancing will likely offer you long-term cost savings. An important side note on taking cash out: You might figure out that this is the right time for you to refinance. Depending on the amount of equity you have already invested in your home, your loan provider might give you the option to get cash back and take out a bigger loan. While this might be tempting, we strongly recommend that you avoid this option if possible. It will likely cost you more money in the long run, could possibly wipe out any potential savings you make from the refinance, and might extend the amount of time until you can be debt and mortgage free. This option benefits the lender (who makes more money off the larger loan), not you. Just say “no” to this option!! Are you planning to refinance your home? Do you have any words of wisdom you can share from your home refinance experience? We’d love to hear about it (please leave a note in the comments section)! I was just talking with a friend about the abundance of fake/scam phone calls that have filled their voice mailbox in recent weeks. If this is happening to you as well, you might take comfort in knowing that today, the Federal Trade Commission announced it is filing legal action against several telemarketers. These firms have made pre-recorded sales pitches to phone numbers registered on the U.S. National Do Not Call list and disguising the Caller ID of these “robocalls” with inaccurate names. Making such automated, pre-recorded sales calls to consumers without their written consent violates FTC rules. Hopefully the FTC actions will help end or at least cut down on the number of these calls. Go here to read the original announcement from the FTC . Posted in Cell Phone and Wireless, Cheap, Financial Tips and Tools, Saving, Giving, and Living, Stretch your Dollar! Mortgage Rates Hit A Record Low! Is Refinancing Your Home a Wise Option? If you answered “no” to either of these questions, it might not make sense for you to refinance at this time, as loan costs could exceed any potential interest savings. Keep reading, if you said “yes” to both questions or if you don’t know the answer (we’ll help you figure that out below). Shop for the best refinance deal. We recommend that you only look at fixed interest loan rates (go here to learn more) from reputable loan providers. Also compare your total closing costs and refinance fees among potential lenders, costs like: points, survey fees, appraisal fees, attorney fees, mortgage prepayment penalties and more (read the list of potential fees here). Ask each lender to give a complete list and total cost of fees in writing so that you can make a fair comparison. An important side note & warning on taking cash out: You might figure out that this is the right time for you to refinance. Depending on the amount of equity you have already invested in your home, your loan provider might give you the option to get cash back and take out a bigger loan. While this might be tempting, we strongly recommend that you avoid this option if possible. It will likely cost you more money in the long run, could wipe out any potential savings you make from the refinance, and might extend the amount of time until you can be debt and mortgage free. This option benefits the lender (who makes more money off the larger loan), not you. Just say “no” to this option!! Posted in Cheap, Financial Tips and Tools, Home and Garden, Saving, Giving, and Living, Stretch your Dollar!